On the DJzone Bench today we have the CHAUVET Nimbus. The Nimbus is a low-lying fog machine that takes old technology and makes it new again to give DJs another great weapon in their wedding arsenal. Back in the late seventies during the disco age, clubs used to use dry-ice foggers that were huge 100 gallon barrels filled with water and equipped with heating elements. The heating elements would bring the water to a boil and then some brave soul would drop 50-100 pounds of dry ice into the barrel creating a fog that would cover the dance floor for about 20 minutes. These units were huge, heavy, messy, and took a dedicated 220 plug and someone to man them. Moving forward 30+ years, CHAUVET has taken all the good features of the old style disco-age fogger and created a light weight portable unit that is aimed to create a once in a lifetime look and feel to a Bride’s first dance. The Nimbus, though based on old tech, has come a long way from the days of huge oil barrels filled with boiling water. Looking at the Nimbus, you see a small black box with a round outlet on the side. It stands only 2 feet tall and to most people, looks like an ottoman you would have in your living room. Made of a strong composite plastic, the Nimbus is easy to carry into an event. So we have a black plastic box with a hole in the side. What’s so special about that? The box itself may be compact, but it houses some well thought out technology. Opening the top metal door, you will see a stainless steel basket that is raised and lowered by a lever on the outside of the unit. Looking beyond that basket, you will see two small highly efficient heater elements. 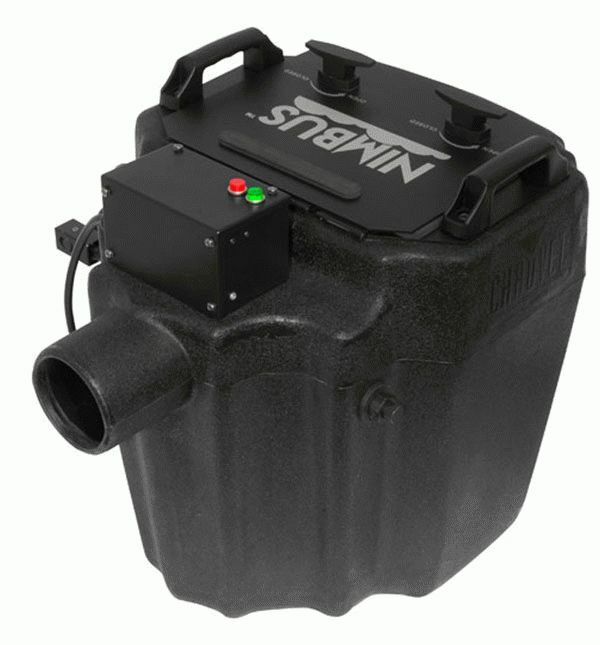 On the outside of the unit is a smallish black box with two lights, a neutrik powercon, and a power cord. This is the brains of the Nimbus. The one cord is to power one heating element and attaching the extra cord to the neutrik powercon allows you to super charge the heating process by powering up the second heating element. The two lights show power and one will change from red to green confirming your Nimbus is ready to go. Our first test was to fill the unit with cold water from a hose (about 5 gallons) and time the heating process. It took just under 45 minutes using both heating elements to reach operating temperature. We then dropped a 5lb hunk of dry ice into the basket and lowered it. This gave us a very lackluster effect, nothing like the photos we have seen. In a later test with cold tap water and one element it took about 1.5 hours to reach operating temperature. This time we took 5lbs of dry ice and using a hammer, we crushed it into chunks, then filled the basket with it. Bamm! We had the effect we were looking for. It filled the warehouse with a cloud of fog. Pulling the lever and setting it on the mid setting, we had fog flowing for about 5 minutes, more than long enough for a first dance. First stop was to the local grocery store and to pick up 15 lbs of dry ice ($14 total cost). There are many places you can find dry ice. It comes in chunks and in pellets. CHAUVET suggests the pellets, but the chunks work fine if they are crushed down into small pieces. Always use gloves when handling the dry ice. I will say that once again… use gloves. Dry ice is so cold even the smallest piece will burn you. It is not a toy and every precaution should be taken to prevent injury. We took CHAUVET’s advice and found a hot water source at our venue to facilitate the heating of the water. It was in a janitor closet and the water was steaming hot. We were told some DJs have found sources in venue kitchens, but the janitor closet did not require us to get permission like the kitchen most likely would. The Nimbus does draw a lot of power, so we found two dedicated circuits prior to the setup day during our initial walkthrough and used them for power. Within 10 minutes, we had a green light and were ready to roll. With the Nimbus pointed at the dancefloor and a green light glaring at us, we felt like it was Christmas morning and the presents were just sitting there. The lights dimmed, the Bride and Groom took each other in their arms and started to dance. The green light switched to red. We were in one of those should we or shouldn’t we moments. We dropped the dry-ice in the basket, prayed, and dropped the basket into the steaming water. With a silent whoosh, the lower half of the couple was engulfed in a cloud and then it settled into a nice layer that sat about a foot off the ground. 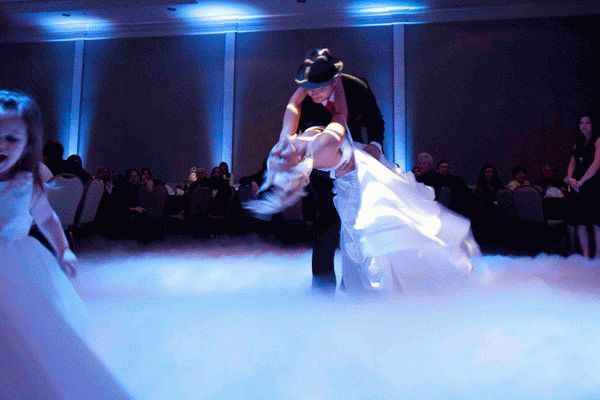 You could hear the guests gasp as the couple danced on this ethereal cloud. It was magical. All eyes were on the dance floor. We had nothing but raves about the first dance from the couple, their families, the guests, and the venue that night. It made what was a memorable moment at their reception, unforgettable. The up-charge was $300 and total profit was $286. We took the Nimbus on the road with us to see what other DJs thought of it. Greg and Jerri Wallace from Elite Entertainment in Manteca caught up with us at the One Stop DJ Shop in Modesto. Some of the concerns they had was the ability to find dry ice. With a few clicks on my phone I located 3 places in and around their area that had dry ice. Another concern they had was what to do with the hot water when the event is over with. At our test wedding, we used a small flat cart we had purchased at Costco to push the Nimbus around on after it was filled with water. We showed them that two people can carry the unit outside and just dump the water out of the side port where the fog comes out. Greg and Jerri also questioned us if this unit will set off life safety systems (AKA Smoke detectors). Since the Nimbus produces low-lying fog that is comprised of water molecules that dissipate quickly and are not detected by even the latest detectors. Short of placing it on a ladder and shooting it directly at the detector you will be fine.This low cloud will NOT set off a fire alarm because it is not hazer or fog which rises. The dry ice cloud keeps 24 inches from the ground then dissipates. TIP: When presenting to a banquet coordinator make sure you refer to it as "cloud" not "fog". As you know, they don’t like the “F” word in catering halls. Water molecules… doesn’t this mean the floor will be slick? We tested both the floor in the dry climate and the humid climate and there was little to no water residue on the floor. Lastly, they said some of their venues are lucky enough to have one circuit for them to plug into, where are they going to find the extra two plugs? Using hot tap water and just one plug, we were able to achieve an operating temperature in the store within 30 minutes. You basically use two when you really really need it to be hot now. One thing we noticed in our Modesto visit was that the humidity of the location you use the Nimbus in plays a huge role in the fog production. Our original test was in a dry climate and it did well. It gave us a respectable cloud for our couple. On this humid day in Modesto, the fog production was over the top. We set the lever on the side to the lowest setting and it produced fog for around 8 minutes using 15lbs of broken up dry ice. The Nimbus is a keeper. Be it a little awkward to get setup, it produces an effect that will be huge with your bridal clientele. It will work as an up-sell or as an add-on to close the deal. TIP: Since it's an easy upsell when brides see pictures or videos of the effect Chauvet has something to help. 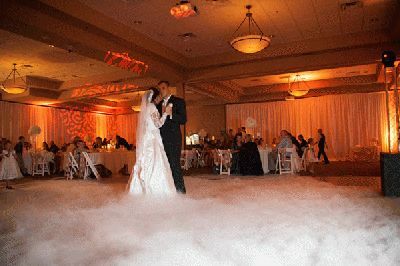 http://www.chauvetlighting.com/nimbus.html page has a downloadable bride groom dance on the cloud graphic you can put your logo on and use it to upsell the "Dance On The Cloud".